Fifteen Northwestern Engineering rising sophomores studied sustainability in Heidelberg, Germany. Would your career trajectory have changed if, at age 19, you could have discussed cutting-edge technology, innovative efforts in sustainability, and career opportunities with the head of a multinational corporation in a country widely recognized for its global leadership in sustainability? 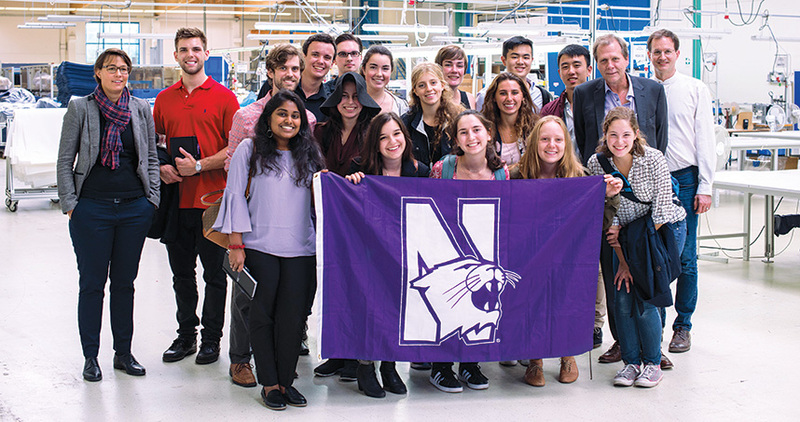 That’s exactly the experience that 15 Northwestern Engineering rising sophomores had in September 2017 in Heidelberg, Germany as part of the inaugural Global Engineering Trek in Sustainability. The trek focused on giving young engineers first-hand exposure to international companies, non-governmental organizations, entrepreneurs, and universities that have taken the lead in developing sustainable solutions to everything from energy production and urban infrastructure to manufacturing and carbon science. “In Germany, we saw how government incentives and the general culture of the population help incentivize and make it economically viable to make big investments and changes in favor of sustain-ability,” says Andre Schweizer, an industrial engineering major. Created jointly by McCormick Global Initiatives and the Institute for Sustainability and Energy at Northwestern (ISEN), the trek is tailored to rising sophomores. Because these students still have several years of study remaining, the program could affect the direction of their studies. The trip was made possible in large part by funding from the Murphy Society. Based on the first year’s success, the program will continue in 2018 with past student participants taking on leadership roles.